We have still about three weeks to go before the launch, so I think that we are quite well in the schedule — assuming of course that there are no unpleasant surprises lurking behind the corner. The keel project is advancing according to the plan: the keel is now coated five times with Teknos Inerta primer 5 (epoxy primer). After the underside of the keel is antifouled twice, Dolphin Dance can be lowered on her keel. 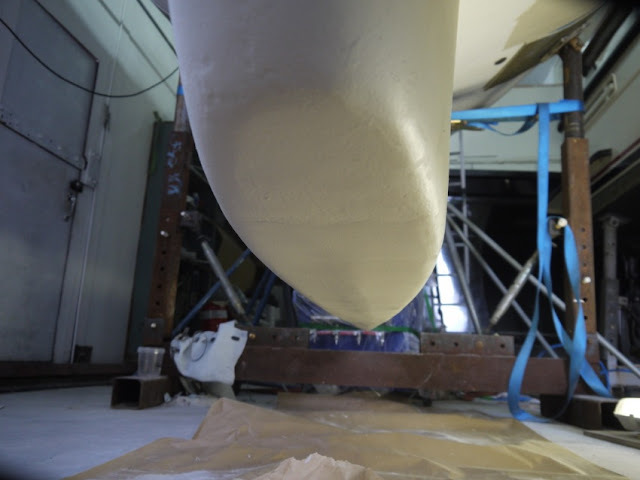 The underside of the keel is difficult to operate during the normal winter haul-out, so it is good, that it is now properly made. 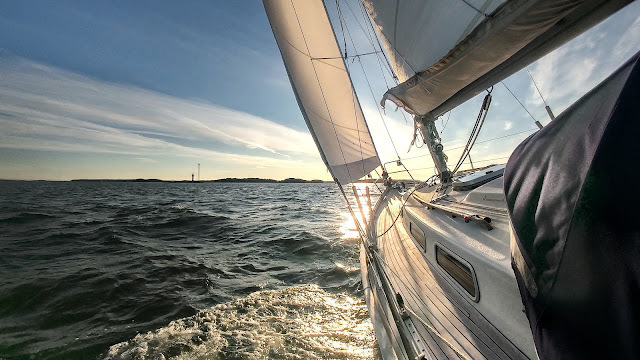 We try to avoid scratching the keel in the coming season. DD's topsides were polished and waxed already last autumn, so this saves quite a lot of time now in the spring. The plan is to wax the topsides once more (with a hard wax), but that is pretty straight-forward and quick job compared to the rubbing stage. The teak deck is one of the most time-consuming projects during this spring. 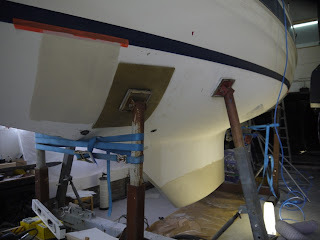 Now that the air is dry in the shed, one can see the places where the caulking has separated from the teak. 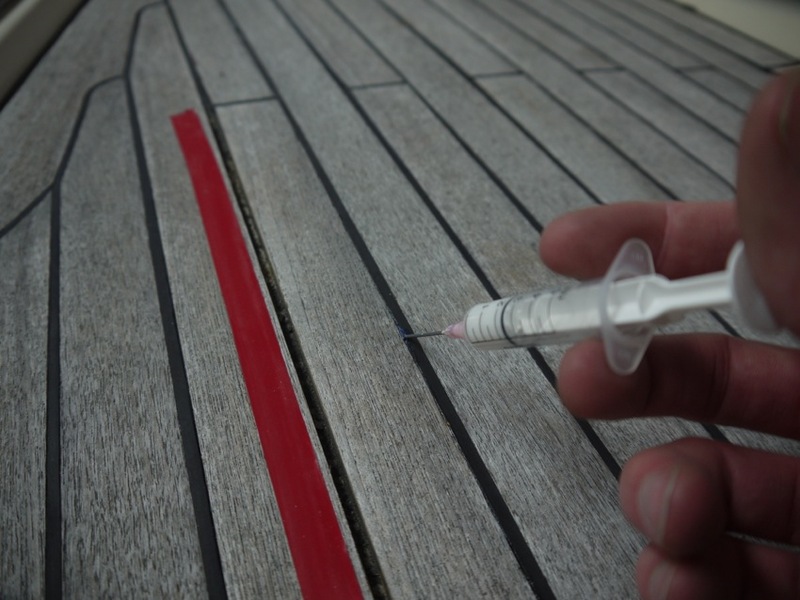 When the teak gets wet, it expands and therefore it may be difficult to locate those areas during the season. 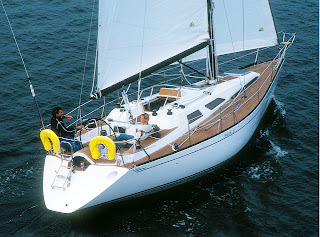 Furthermore, all the repairs to the teak deck should be made, when the teak is thoroughly dry, which may be impossible to achieve during the sailing season. In addition to replacing some caulking at few spots, I also tried a bit different approach this year: I bought Capt. Tolley's Creeping Crack Cure, which I injected to all the seams, which looked potentially leaky. Crack Cure has a very low viscosity, so by using capillary action, it finds its way even to the fine cracks. When cured, it should make flexible and strong bond. I will report later how well this method works. 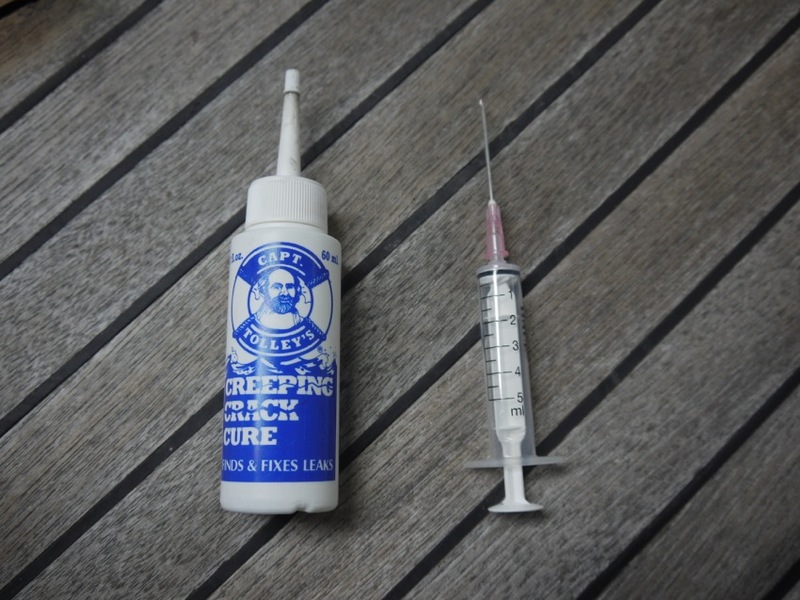 In general, Creeping Crack Cure is easy to apply. However, according to some internet discussions, the Creeping Crack Cure can leave nasty black spots on the teak, which may be impossible to clean later. Therefore, I cleaned all the spills instantly with a cloth and acetone. This quick action seemed to be sufficient and fortunately we did not have problem with teak turning to black. Also, it is wise to try to avoid the spills in the first place; an injection needle, which can be purchased from pharmaceutical store, helps a lot in accuracy of application.